Meet “The Expert” – This man of mystery is an experienced consultant with a wealth of knowledge to share. 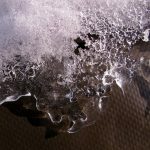 In this article we look at 2 different kinds of waterproofing and look in detail at the best way to waterproof a leaky lift pit. A common problem within some existing lift shaft is ground water ingress into the lift pit area; the lift pit is the lowest section of the lift shaft that generally falls below ground level which makes it susceptible to water ingress. The structure of the lift pit was originally designed and built to hold back any underground water due to the obvious problems which could occur. If water is allowed to enter an area which contains essential pieces of the lift gear and other electrical items a potentially dangerous situation is created. Over time the water previously held back by the structure begins to find its way through any defects and cracks which have been forming over the years, these defects are usually caused via movement in the structure or just by general deterioration of the individual construction components like the concrete or the water bar etc. Once this water has entered the lift pit it is usually contained and over time a pool of water forms on the pit floor. The water would normally cease filling when it reaches the height of the water table or perched water table that has formed behind the structure. In this article we look at the two different ways of lift pit waterproofing, and consider which system is the most suitable for this kind of waterproofing problem. Looking at factors such as: which method would give the structure the most protection, the longevity of the systems and the ease of application. 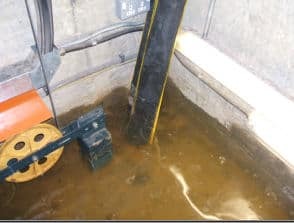 We have not considered a sump and pump application due to the fact that the water in the lift pit may be contaminated with oil & grease from the lift gear. This means it must never be pumped into the drainage system. The disposal of any water from a lift pit must be performed in line with the Environment Agency Pollution Prevention Guidelines. Timberwise can dispose of any oily water waste from lift pits in a safe manner. 1. Do the waterproofing systems protect any reinforcement in the concrete? A majority of lift pits are constructed of reinforced concrete walls and floor slab. It is crucial that any reinforcement remains intact and corrosion free. If water was to come in contact with any exposed reinforcement bars contained in the concrete structure it could cause the bar to corrode and subsequently swell. If swelling of the bar does occurs it would cause the surrounding concrete to crack and break away creating additional defects. This waterproofing system is carried out by applying a layer of waterproof render to the internal face of the pit. This layer would not restrict the water from entering any cracks or defect to the external face of the structure. This would mean that corrosion of the reinforcement bar and further deterioration of the lift pit structure could still occur. This type of waterproofing system is ‘installed’ by drilling holes through the structure and injecting a resin into the substrate behind. The resins saturate the substrate, filling any voids that exist, and, after a short reaction time, a waterproof gel is formed bonding all the substrate together and creating a waterproof barrier. Alternatively, holes can be drilled into the structure intercepting any leaking cracks or defects found. These are then injected with a waterproof resin. Under pressure the resin seals any fractures and joints within the structure forming a waterproof barrier. 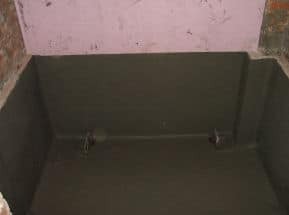 Both of these techniques would stop the water from coming in contact with the reinforcement bar and reduce the risk of future problems. 2. How does the System Handle Movement in the Lift Pit Structure? It is expected that all buildings will move during their lifetime and to varying degrees, with the lift shaft structure being no exception due to the movement of the lift car and the weight concentration bearing down onto the lift pit walls. It is therefore important that any lift pit waterproofing system can handle movement within the structure. Waterproof renders are cement based system which creates a very rigid system with minimum flexibility; any small amounts of structural movement or even thermal expansion and contraction can create a situation where the render is forced to crack and subsequently fail – allowing water seepage into the lift pit area. Injection waterproofing can be carried out using flexible resins. Due to the flexibility of the resins structural movement and thermal expansion movement can be tolerated without affecting the structural integrity of the waterproofing system. If defects were to occur in the waterproofing systems can they be fixed quickly and effectively? Once the reason for the waterproofing defect has been ascertained and the cause has been rectified any defective render should be removed and new render reapplied as per the manufactures specification, patching up of the waterproof render is possible and can be successful however, it can leave a venerable weak point around the joints. Ordinarily this kind of repair would be carried out over 2 days. Injection waterproofing is fully maintainable and new material has the ability to bond to old material even in after is has been in contact with soil for many years. If a leak does occur the repair is very straightforward. Having located the entry point of the water, a hole would be drilled into the structure to intercept the defective area and a waterproof resin injected to create a bonded watertight seal. Injection material can be injected into defects sizes down to 1/10th of an mm which is barely visible to the naked eye. Injection repairs can be carried out with minimum disruption and usually take around ½ a day to be carried out. 4. 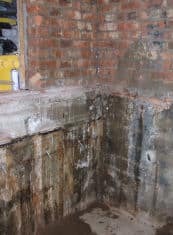 What Preparation of the Lift Pit is Required Prior to Waterproofing? Due to the presents of oil and grease which is more often than not found on the floor and on the walls surfaces in lift pits, what are the implications of this on the waterproofing methods? The waterproof render system relies fully on its ability to hold back the water as well as the bond between the render and the surface it is being applied to. All surfaces must be 100% roughened, either by hacking or, for new uncontaminated concrete wire brushed and both must be thoroughly washed down to remove all surface contamination otherwise the render system will fail. Immediately prior to application, the substrate must be soaked with clean water, however, no standing water or puddles should be present. The infiltration of water must be stopped prior to application using a suitable product or the water table must be lowered. The injection waterproofing system targets only the areas of ingress i.e. cracks and joints, and due to the fact the resin is pumped into, or behind, the structure very little preparation work is required for the system to work effectively. It is not uncommon though for a badly defective area to need making good, a wall/floor joint been formed or even a slurry coat been applied to the surface of the walls and floor areas for aesthetic reasons. In these instances minor preparation may be necessary. Due to restricted access and work area space within a lift pit, it is crucial that the application methods for the waterproofing system are clean and simple with minimum disturbance to the surrounding areas. Due to the limited amount of space, storage area and dust normally associated with this kind of work the storage and mixing of the raw materials would normally be carried out in a better ventilated and more convenient position away from the work area. Dust and debris will be created within the mixing area and as a result of mixing the render in a separate location there is a more widespread disturbance. 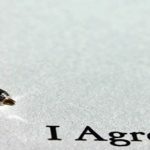 However, the application process unlike the preparation work is relatively noise free. Injection resins come in pre packaged containers which are mixed as they are used at the work area, even if they are stored elsewhere no dust and debris will be created. The installation process does involve drilling of the structure and the use of a compressor so invariably some noise will be produced during the installation period unlike during the preparation works. 6. How does Water Pressure Affect the Systems? Due to the nature of the work ‘holding back the water’ this process would inevitably cause the water to build up behind the structure, as this water builds water pressure will be created. This pressure will be constantly coming to bear on the waterproofing system putting it under pressure. Assuming the preparation and application of the systems had been carried out to a high standard how would this pressure affect the systems? Due to the render being applied to the internal face and the water pressure being present behind it this would put pressure on the bond between the render and the surface material it has been applied to, if the condition and strength of the backing material remains sound then the render would be unaffected, however if the original structure material was weak or compromised due to constant presents of water and dampness within it then due to the pressure the render system would stand an increased chance of failure. Due to the gel/resin having been injected into or behind the structure this system would not be affected by water pressure. As a result it would also be able to withstand far greater water pressure than the render system. Waterproof render is an effective way of holding water back; however in an existing lift pit application the system does have its draw backs. As the system is applied to the negative side of the structure (inside) with the water pressure behind it which is effectively trying to push the render off the wall with the added problems of oil & grease contamination to the wall and floor surfaces then the reliability of the system may be put into question. The render system doesn’t offer any protection to the pit structure itself. It allows water to penetrate which could allow any reinforcement bars present to corrode and increase the chances of further and more serious problems within the lift pit walls. With the renders reluctance to be flexible in an area where movement should be anticipated and with the probability of it being punctured during the reinstatement of the lift gear there is every possibility that the waterproofing solution could fail. The preparation and application work involved with the render system can also lead to a partially noisy and dusty work spread over a wider area creating more disturbance than is necessary. All of the lift gear would have to be removed and subsequently replaced to facilitate the correct application of the render system, as opposed to minimal amounts of lift gear that would require removal for the injection route. This adds further cost to any render waterproofing system over the injection waterproofing route. As with the waterproof render Injection waterproofing is a very effective way of holding back water, resins are injected into or injected behind the structure (positive side) which means it can withstand greater amounts of water pressure. It doesn’t rely on surface preparation or the quality of the structure so its failure rate is undoubtedly lower. The resins are also extremely flexible and the system is easily maintainable. Injection waterproofing is then the quickest, cleanest and most effective method of waterproofing lift pits. A very erudite and informative article. 3a. I think you mean ‘vulnerable’ rather than ‘venerable’. 4 ‘Presence’ rather than ‘presents’. Thanks for the feedback Len! Damn that spell checker!